Over $36.9bn in capital expenditure will be spent over the lifetime of the top 10 upcoming offshore heavy oil projects to produce 2.6 billion barrels of oil. 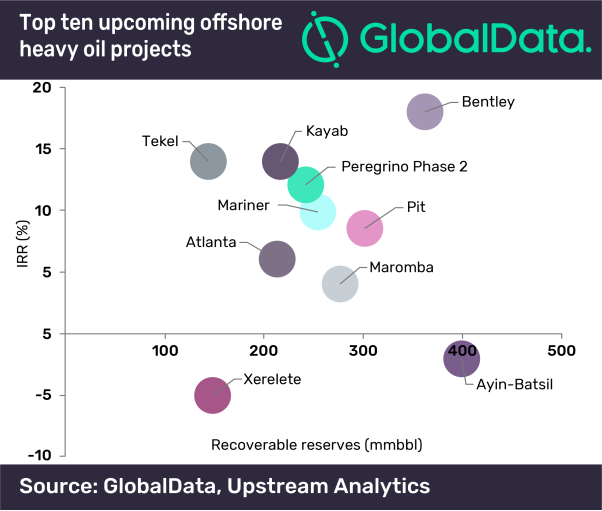 These 10 projects, selected from 18 upcoming offshore heavy oil projects globally, will contribute incremental capacity of 400.5 thousand barrels of oil per day (mbd) to global oil supply by 2025, according to GlobalData, a leading data and analytics company. Ayin-Batsil, an announced shallow water field in Mexico that was not awarded during last year's bidding rounds, is the largest with anticipated peak production at 62.9 mbd in 2030 at an estimated cost of $5.9bn. GlobalData reports the average development breakeven oil price for top upcoming offshore heavy oil projects at $53.2 per barrel (bbl); while projects in offshore Brazil have both the lowest and the highest with $37 and $83 per bbl, respectively. The company notes that five of the top ten global offshore projects do not meet the return threshold of 10% for internal rate of return, necessitating reductions in capital expenditure (capex) or better oil markets. Shallow water Mariner in the UK has the highest net present value per barrel of oil equivalent at $5.6. GlobalData estimates $36.9bn will be spent to bring the top ten offshore heavy oil projects online, with $17.9bn forecast by 2025. Early-stage shallow water project, Ayin-Batsil, in Mexico will lead capital investment with estimated $5.9bn over the development lifetime, followed by heavy oil project Pit in Mexico with estimated $3.0bn, if awarded during one of the following Mexico bidding rounds as Pemex will try again to find new partners to develop some of its heavy oil offshore fields. GlobalData expects full-cycle capex per barrel of oil equivalent to average $12.8 for shallow water, $16.5 for ultra-deepwater, and $32.3 for deepwater.